On November 6, the '2018 MGA' took place at Namdong Gymnasium in Incheon. The event was hosted by MC Jun Hyun Moo, and his girlfriend Han Hye Jin joined as an award presenter. Jun Hyun Moo introduced his girlfriend with the words, "The best model of Korea who has become even prettier lately after falling in love." 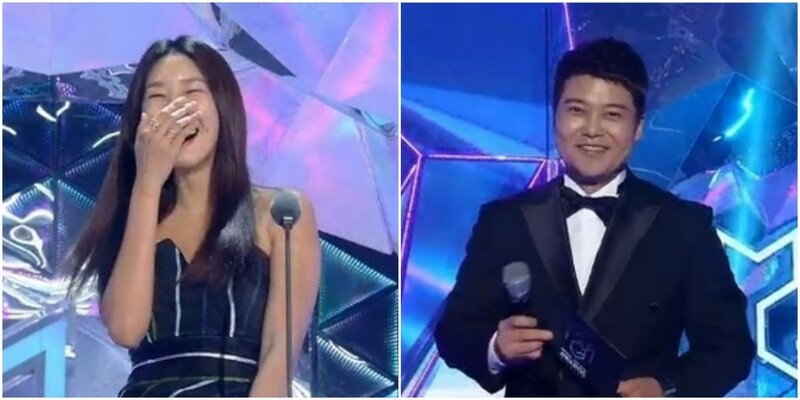 Han Hye Jin walked up to the stage and first said, "Thank you for inviting me to the amazing award show," and added, "The MC is very dashing today as well." The two stars confirmed their relationship in February. You can check out all the winners and performances from the '2018 MGA' here. We need a video for this!